An example of an album page for “5”. 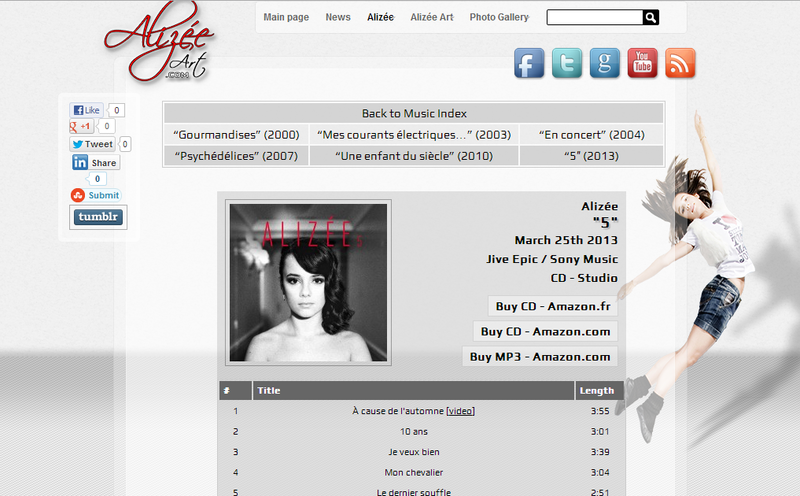 We have today added whole new section to Alizée Art, a “Music” section. On the main menu you will find it just under “Alizée”. For now, the section has listings of Alizée’s albums and their tracklists and links to music videos of her singles. In near future all the lyrics will be added (with translations) and small samples of all the songs. Obviously also more detailed pages for all the singles will be added. Later in future is planned to add different versions of the albums and other relevant information. Also the most important TV peformances will be included, where Alizée has sang duets with other artists, plus all the cover songs that she has done during the years, and of course other collaborations such as Les Enfoirés.